Before we jump into the lovely images of our studio, here is a quick intro. The impressionist is a paper + invitation studio that specializes creating custom letterpress wedding invitation suites. Meeting with brides in person at our location inside alee & press allows us to really get to know their vision. And also, we get to show off the presses! 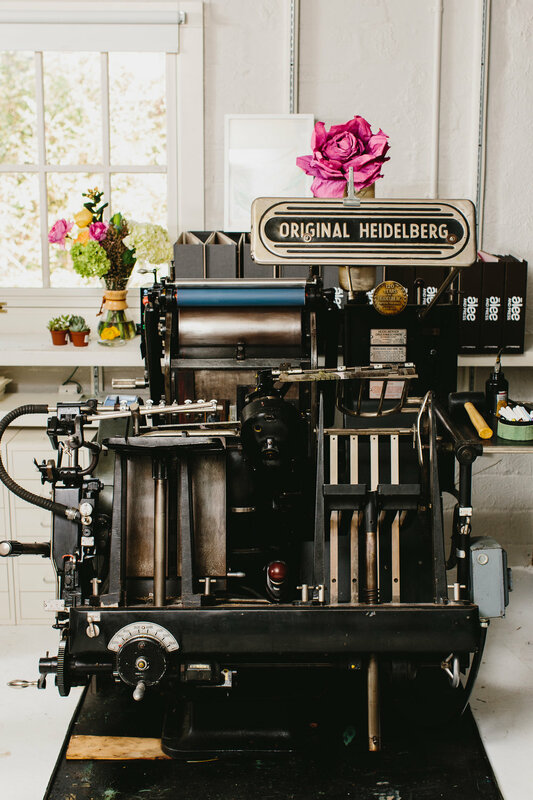 A quick peek inside the letterpress production room of Alee & Press. Now let's jump into the pretty paper and our presses! Alee & Press | where all of our printing and production work happens. VANDY IS OUR BREAD & BUTTER. We print daily on this guy, and the majority of our projects through The Impressionist are printed here. HERMAN IS OUR BEST MAN. He is our go-to for our larger runs, and where most of our larger wholesale orders through Alee & Press are printed. Our production table rarely looks like the image above though! It's typically filled with paper waiting to be pressed, orders that are ready to be cut down to size, invitations ready to be shipped, and boxed orders ready for delivery. All our colors are custom mixed ink to match Pantone colors, and it is a pretty mesmerizing process. If you want to catch some videos follow us Instagram and check out our stories. This is the space where all of our consultations, brainstorming, and the start of every suite begins. Check out one of our recent blog posts here to see how we go from meeting brides to creating custom suites for their weddings. On our archive wall, we have a few of our favorite pieces displayed so our brides can browse for inspiration, or just to give us a feel for what they are drawn to. We hope this brief tour has given you a small glimpse inside the studio, and the environment. We always joke that the only thing formal here is our invitations. We keep all of our consultations relaxed and informative. Ensuring that each bride gets the suite they have been dreaming of, even if they didn't quite have a vision when we first met. Valentine's day has officially come and gone for 2017, and this year we celebrated it with our best gals! Our Galentine's day floral workshop was a huge success, thank you to everyone who joined us in creating some lovely floral arrangments. Now for us all to go home and practice!